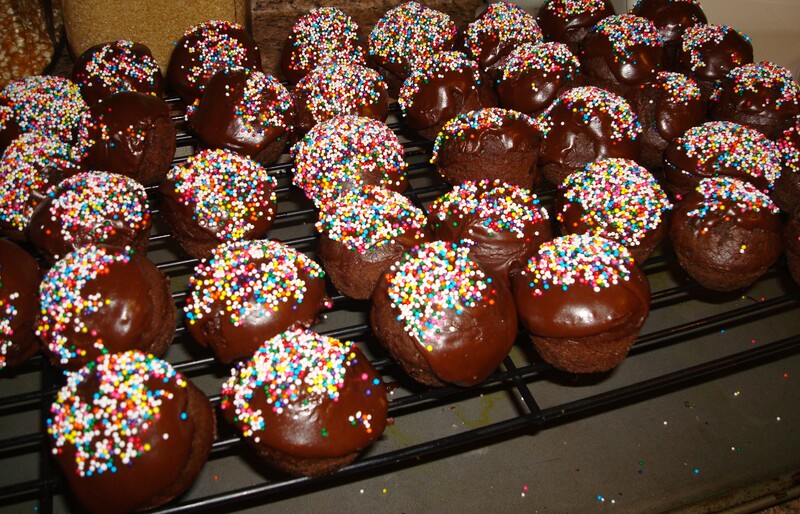 As a kid, I thought Munchkins were SO much fun. I loved being able to try different flavors and I loved how ease it was to just pop ’em in my mouth! …and I’d definitely be lying if I said I didn’t still think all of those things. Anyway, that was all fine & dandy as an active kid, when your metabolism can seemly handle almost anything. Now I try to be at least a little bit more health-forward. The other day I found some donut muffin recipes!! Aka the healthy munchkin. Yeah, that word healthy gets used and abused now-a-days. Let’s clarify, they are NOT healthy. 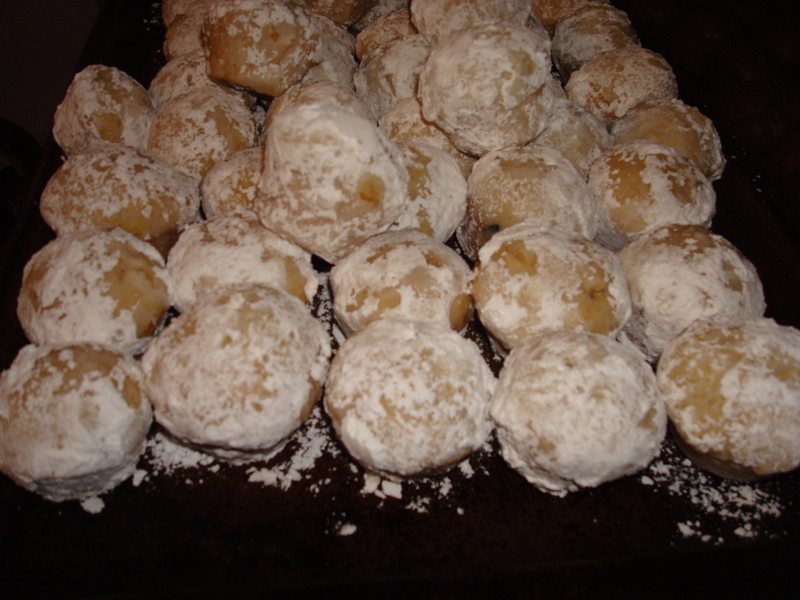 But, compared to the fried donut holes, this baked option is certainly a good alternative! And as a treat, they’re great! So much fun! Just about the same size as the original munchkin, so you can still pop ’em right on into your mouth. And small enough to try different ones! I was truly impressed when I tried these. They taste amazing! Just as sweet and satisfying as the real thing!! I’m thinking I’ll experiment with a bunch of different flavors. Coconut? Chocolate coconut? Pumpkin? Cinnamon? Jelly? Why not?! Try them out! You’ll need mini muffin tins. Or heck, if you only have regular-sized muffin tins, you could make not-so-munchkin-sized versions! 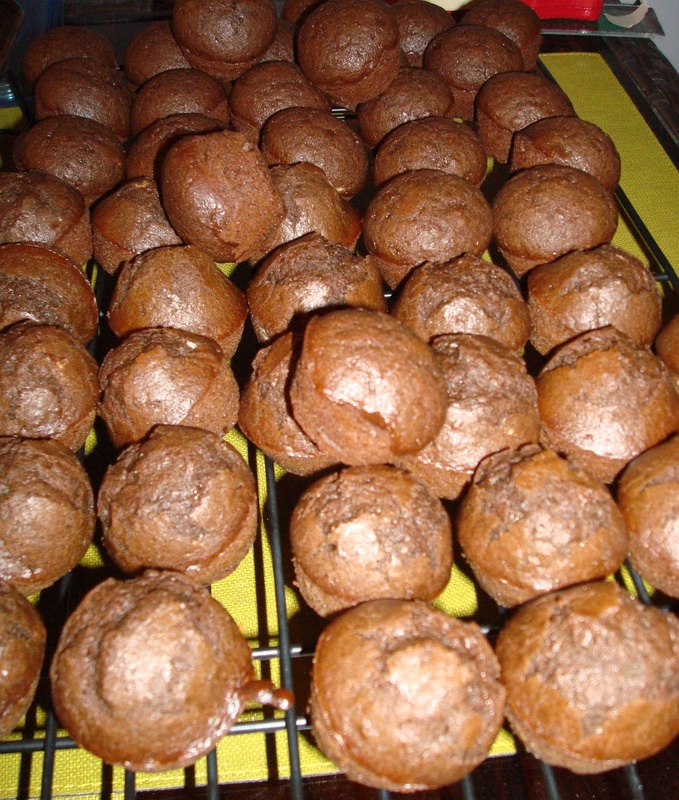 1) Preheat oven to 425 degrees F. Spray 4 dozen mini muffin cavities with non-stick cooking spray. Set aside. 2) In a medium bowl, whisk together the flour, cocoa powder, baking powder, baking soda, and salt. Set aside. 3) In a large bowl, use a hand mixer to beat together the vegetable oil and sugars. Then add in the eggs and beat until combined. Now, switch to a rubber spatula. Add in the the dry ingredients, the milk, and the vanilla. Fold it all in gently until it’s well combined, but make sure not to overmix! 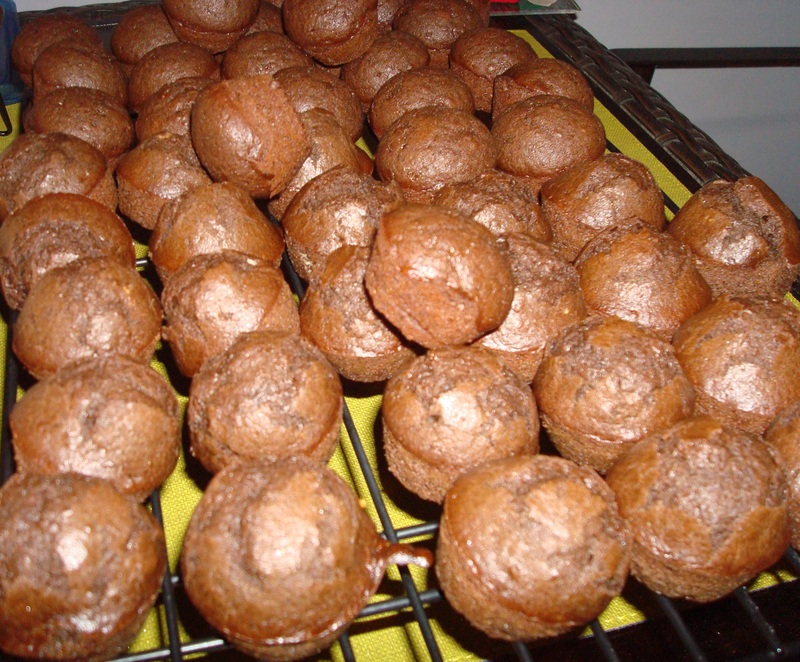 4) Now, using a small cookie scoop (or spoons) scoop the batter into each mini muffin cavity, filling about 2/3 full. Bake in the preheated oven for 10-12 minutes. Start checking at 10; mine were done. 5) Allow them to cool in the pan for a few minutes, then turn out onto a wire cooling rack and cool completely. 1) In a medium-large saucepan, combine the butter, milk, cocoa powder, and corn syrup. Heat over medium heat, whisking constantly, until it begins to boil. Remove it from the heat. 2) Whisk in the powdered sugar. Then, whisk in the vanilla. 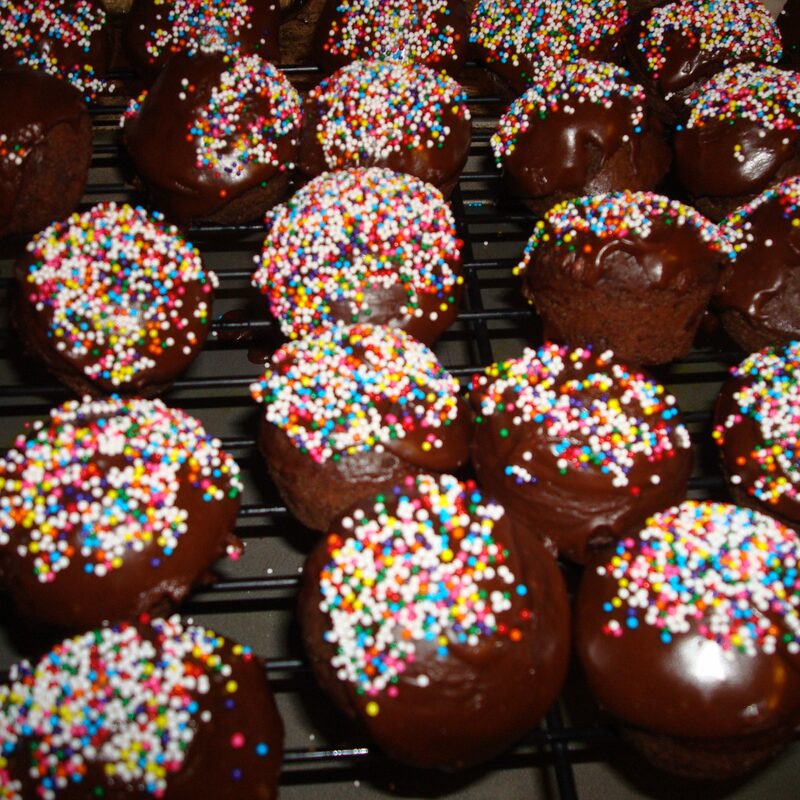 3) Once the munchkin-muffins are cool, dip them into the chocolate glaze, and then place back onto the baking rack (dipped-side up). 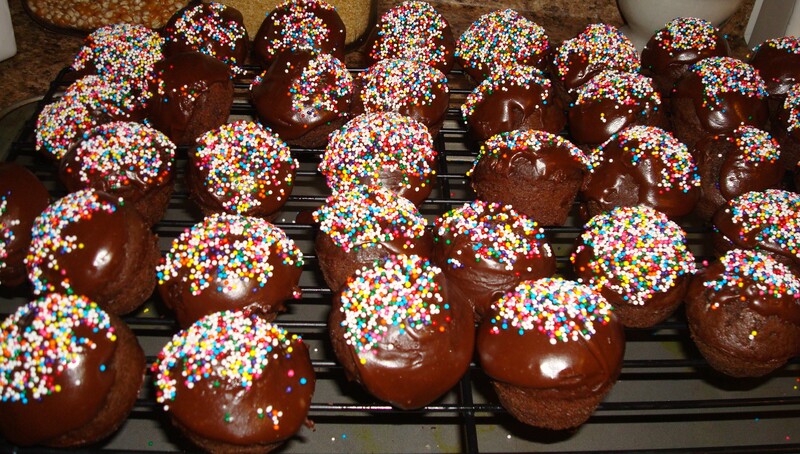 After you do a bunch (maybe 6-12) go back and dip each one into the colored sprinkles! This allows the glaze to dry just a bit, but not too much, so the sprinkles still stick. Continue doing this until you’ve covered all of the munchkin-muffins! But hold on! Now for the..
1) Preheat oven to 400 degrees F. Grease 4 dozen mini muffin cavities with non-stick cooking spray. Set aside. 2) In a medium-sized bowl, whisk together the four, baking powder, cinnamon, and salt. Set aside. 3) In a large bowl, using an electric mixer, beat together the butter and sugar. Then add in the eggs, mixing well.  Switch to a rubber spatula. Fold in the flour mixture, the milk, and the vanilla, all just until combined. 4) Using a small cookie scoop (or spoons) scoop the batter into each mini muffin cavity, filling about 2/3 full. Bake in the preheated oven for 10-12 minutes. 5) Allow them to cool for a few minutes and then turn out onto a wire cooling rack. 6) Melt the 1 stick of butter in a bowl. Put the powdered sugar into a bowl. 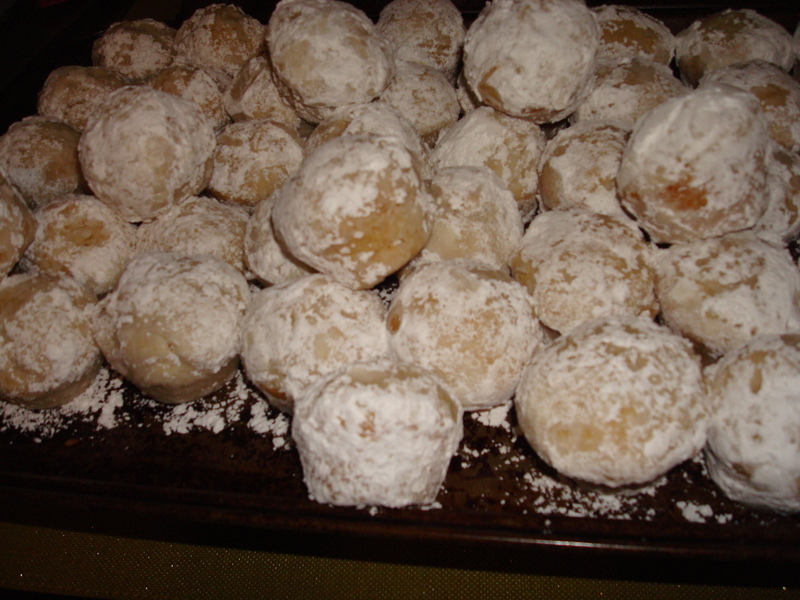 Now, dip each munchkin-muffin into the butter, and then into the powdered sugar. Place back on the wire cooling rack or a plate. 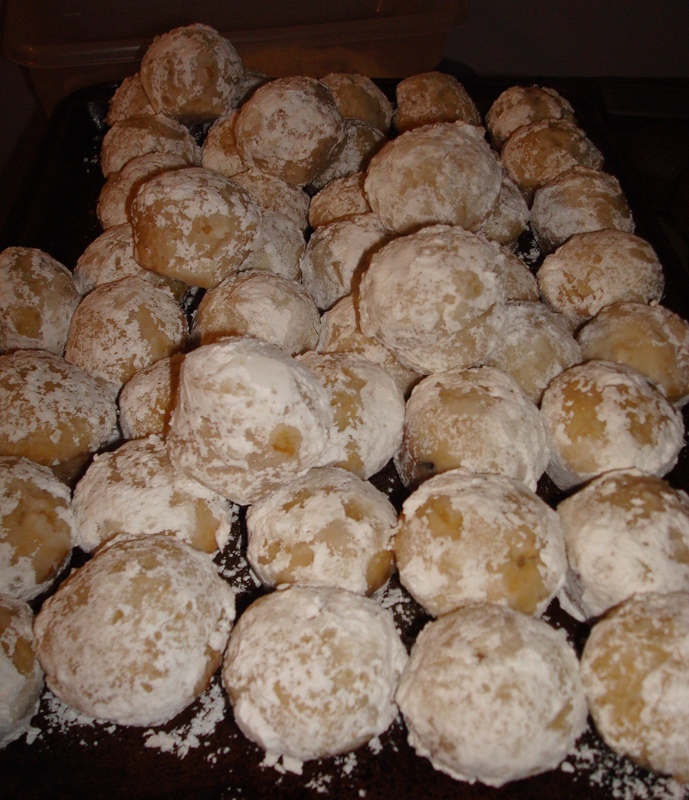 Continue until all munchkin-muffin are coated. As you’ve probably gathered, this made A LOT! 4 dozen of each, so 8 dozen total! I brought them into work. My co-workers enjoyed! I’d recommend having a place to bring ’em, or else you’ll just keep popping ’em in your mouth! What’s your favorite DD flavor munchkin?! I’ll try to experiment to make it a munchkin-muffin!